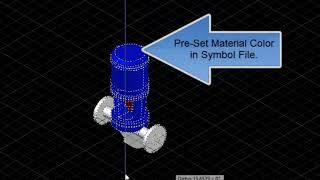 Create a wide variety of Horizontal Split Case Pumps for 3D models. Once the dialog displays select each edit box to enter the data for that dimension. After dimensions are entered you may save the data for use later in another drawing file. You can create a library of different manufactures pumps by saving the data each time. To reuse the previously saved data select the pump name from the pulldown in the Pump Selection area. Dimensional data for that pump will populate the dialog. Select OK to place the pump.